Balmy Summer Nights. Limoncello, Bombay Sapphire Gin and Basil Cooler. Another balmy night. One more day to go before the official start of summer. Let’s drink to that. Chill out and cool off with this very refreshing cocktail of gin, limoncello and basil. Build in a glass or better still a pitcher. Limoncello, Bombay Sapphire and Basil Cooler. BUILD in a tall glass half filled with ice. 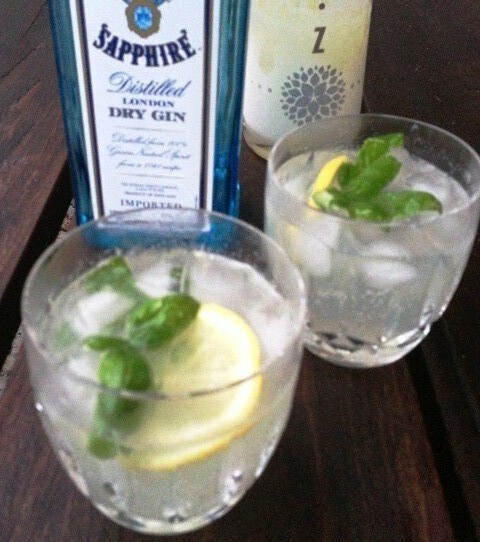 GARNISH with lemon slices and sprigs of basil. This entry was posted in What I Love to Drink and tagged Basil, Cocktail, Cooler, Food, Gin, Ice, Lemon, Limoncello, Summer, Tonic. Bookmark the permalink. 3 Responses to Balmy Summer Nights. Limoncello, Bombay Sapphire Gin and Basil Cooler. I’ll try that tonight. With temperatures soaring to 40 C today in Sydney its going to be a thirsty night.